Nicole Brungardt was named the Journal Star's 2009 girls athlete of the year after a stellar career at Norfolk Catholic. Now she's competing in bobsled for Team USA. 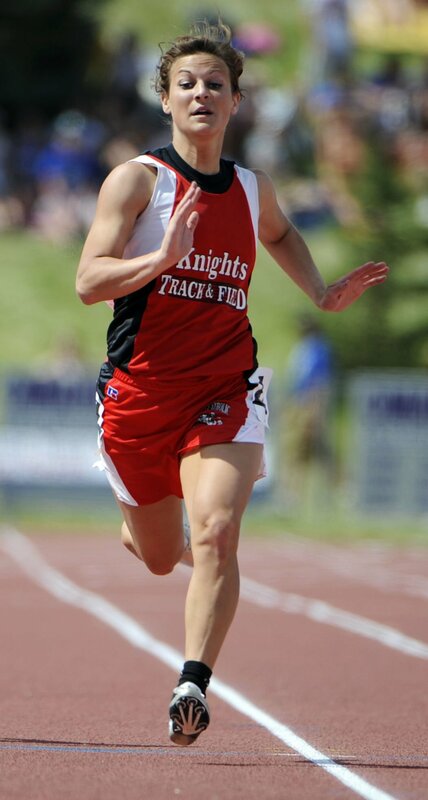 Nicole Brungardt of Norfolk Catholic wins the Class B girls 200-meter dash at the Nebraska state track meet in 2008 and won the Lincoln Journal Star Female Athlete of the Year Award that year. Nicole Brungardt knew something was missing. She didn’t know the missing part of her life was flying down an ice tube at 90 mph, but she knew something was missing. The seven-time state track and field champion from Norfolk Catholic High School longed for the competition. She had set eight school records at Wayne State in her two years of competing in sprints and long jump. Brungardt was even an all-state volleyball player in high school and played in 109 matches for the Wildcats. So when the talk radio segment she was listening to, after a day of work at her field engineering job for CenturyLink in Omaha, talked about Team USA bobsled recruitment combines, her life rerouted. Vonetta Flowers was discussing her transition from running track at the University of Alabama-Birmingham to competing for the United States women’s bobsledding team in two Olympics. A few clicks on the United States’ bobsledding website later, Nicole had her brother — former Nebraska football player Mark Brungardt — on the phone. There was a combine in Park City, Utah, in June 2017. Nicole called to ask her brother to get her in touch with a trainer. She had something to prove. Mark got Nicole in touch with a friend who was a trainer, Lornell McPherson. She worked with McPherson for a mere three weeks. She scored high enough at the combine to get invited to the rookie bobsledding camp in August in Lake Placid, New York. There, she impressed the national team enough that she got invited to the U.S. team trials two months later in October. Five months after that radio segment, Brungardt had qualified for the U.S. women’s bobsledding team. She put a hold on her job at CenturyLink — she makes sure to point out that they were nothing but supportive of her endeavors — and bobsledding took over. Her colleagues even raised money for her support. Since then, a GoFundMe page (gofundme.com/nicoleforgold) has raised over $7,000 to help her travel, train and compete. The skills she brought to the table were pretty simple. Lower body power and speed. That’s exactly what the bobsledding team was looking for. “You pretty much push and run, then you’re jumping in and holding on to a metal bar while going down a track at 90 miles per hour down a tube,” she said. The travel and training has been a little different than she thought it’d be, however. While Brungardt and her teammates were on tour in Europe, they brought their weights with them in vans and cars. That’s right. The U.S. bobsled team trains in parking garages in Europe. Brungardt said most people in the United States would walk into the garage and give the ‘What the heck is going on in here?’ look, but it’s different in Europe. Ten of the 16 bobsled tracks in the entire world are in European countries. Nicole’s tour will take her to Latvia, Germany, Austria and Switzerland this winter. While those competitions are the priority now, she isn’t shy about the big picture. She said the 2022 Olympic rings are on her mind all the time. “I feel like I’ve been living in a dream life. That’s the ultimate goal now,” she said. Maxx Mayfield would roll out of bed every weekday morning of last year’s wrestling season and get a run in before school.